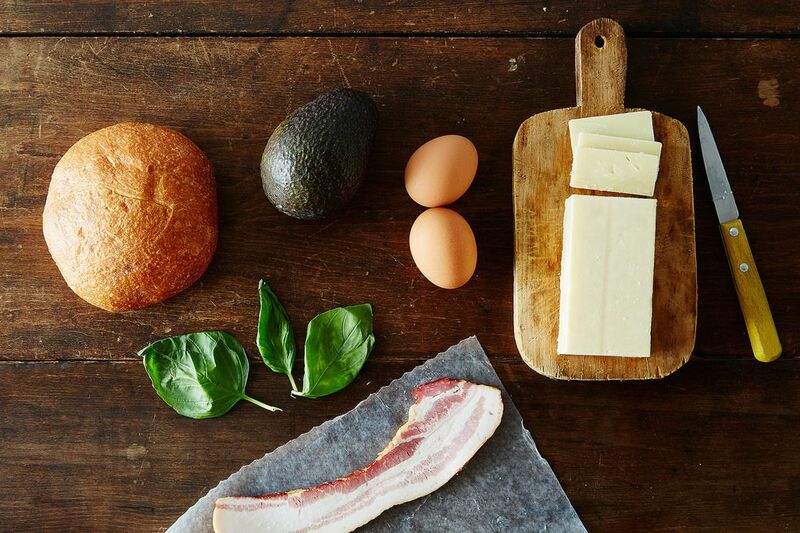 Today: The Eastman Egg Company gives us the insider tips on putting together an egg sandwich so good, you'll look forward to weekday mornings -- and all without a recipe. On face value, building an egg sandwich is simple. But when you start to think about each element, things get complicated. You have your own personal preferences, sure, but how do you make the very best version -- the sandwich that will take your morning from so-so to excellent? How should you cook the egg? Which bread should you choose? What kind of cheese melts well? I asked the experts (egg-perts? sorry, I had to) at The Eastman Egg Company to walk me through the components. These guys know breakfast: They run a popular breakfast food truck in Chicago and recently opened a brick-and-mortar shop, feeding the hungry hordes of the Loop every morning. 1. Choose your bread. As is the case with most sandwiches, the bread decision is crucial. Do not choose your bread lightly! Ciabatta is ideal -- its airy texture better absorbs moisture from the eggs and sauces. A thick bread with rustic crust, though delicious, is not wise: You have to take a more forceful bite, which makes the eggs fall out of the sandwich. Softer bread is better, but you should always toast it lightly. 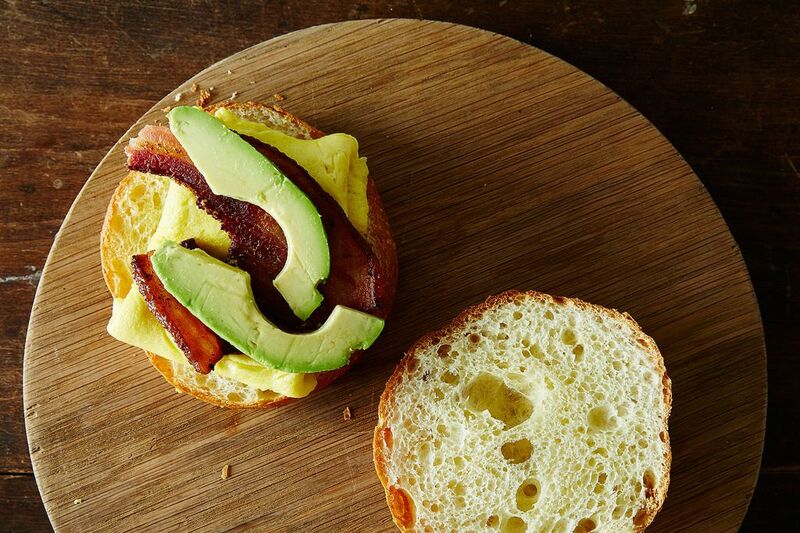 If you can't find ciabatta, a multigrain roll or pretzel roll are both good options. Here, we used a brioche roll. Fresh bread is best, but you are likely not going to run out to a bakery first thing in the morning in your pajamas. Luckily, bread freezes well, so buy fresh bread from a bakery and freeze it. When it’s time to make your sandwich, place the frozen bread in a 350° F oven as you begin and it’ll be thawed and toasted by the time you’re ready for it. More: Learn the best ways to store fresh bread. 2. Cook your eggs. Eastman is pretty religious about using an omelet method of cooking for two reasons. First, it allows you to make thin layers that can be folded on top of each other. Layers take advantage of the naturally fluffy texture of eggs and they give real heft to the sandwich. 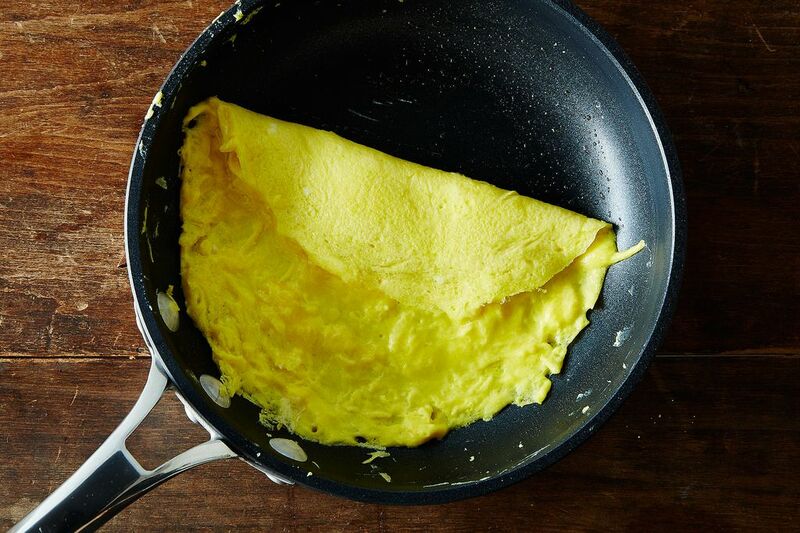 Second, the omelet style reduces the fall-apart factor: While scrambled eggs fall out with every bite, the omelet style keeps everything together. We're all for keeping it together here, guys. The perk of using a poached egg is the gorgeous runny yolk -- but this is a dangerously messy option if you're eating your sandwich on the run. If you don't mind a mess, and you're sitting down for breakfast, go ahead and poach. More: Learn our methods for perfect poached eggs and better omelets. Make sure to use fresh eggs: The fresher the egg, the better the flavor. Because the sell-by date for eggs in a supermarket (with U.S.D.A. inspection) can be up to 45 days after the packing date, Eastman has a quick and easy way to check for freshness: the Julian date. Every egg carton has a code printed on its side, and the last 3 digits of this code are called the Julian date. The code uses a number from 001 to 365 to correspond to a day of the year and indicate when they were packaged. For example, 001 is January 1st and 365 is December 31st. To find the freshest eggs, select the highest number you can find (keeping in mind the numbers wrap around in January). 3. Select your fillings and your cheese. Eggs are the perfect base because their creamy, rich flavor plays well with almost anything, so use your fillings to add texture and temperature variation. Vegetables can be hot (like wilted spinach or kale) or cold (like refreshing cucumber slices or diced bell peppers or creamy avocado). Meat helps bulk up the sandwich: Sausage is good; bacon is very good; chorizo is very, very good. Get creative and experiment with crunchy add-ins like potato chips, panko, and sesame seeds. In regards to the cheese, you need to pick a variety that will melt well. Eastman suggests staying away from older cheeses, like fancier cheddars and aged goudas. They prefer relatively young cheeses with a good moisture content (like a young Jarlsberg or Gruyère). Very important cheese finding: If you’re eating the sandwich immediately, fold the cheese into the eggs while you cook. If you're planning to eat it on the go, or transport it for later, place the cheese on the bread without cooking. Here's why: The heat from the eggs will melt the cheese and pin it to the sandwich, which prevents too much cheese from oozing out of the sides. Folding the cheese into the eggs distributes it better, but it will get too liquidy if you're not eating it immediately. 4. Get saucy. Regarding sauce, keep it sticky. A too-runny sauce will make a mess and will draw out liquids from the eggs, resulting in soggy bread and general unhappiness. To illustrate, you should use a thick Kansas City-style barbecue sauce, not a thinner North Carolina-stye variety. Choose a sauce that has both sweetness and acidity to counteract the richness of the eggs (popular sauces at Eastman Egg are Green Goddess, honey mustard, and sweet chili sauce). Herbs complement eggs well: Pesto or chimichurri would work nicely. If you like heat, add a sprinkle of hot sauce at the very end. 5. Take it with you. You could eat your sandwich immediately, with both hands, over the sink. If that's your style, you can stop reading and get cooking. 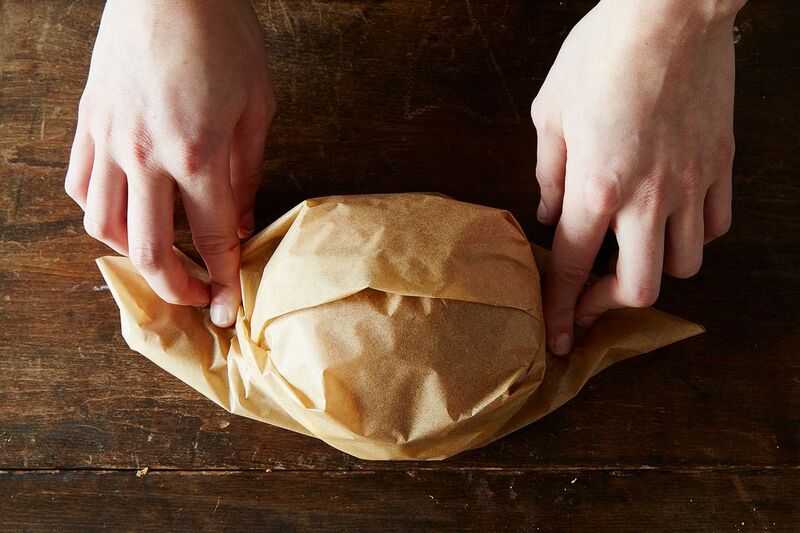 If you'll be carrying your egg sandwich to work (or elsewhere), your best bet is a sturdy wax or butcher paper. Parchment paper or foil are good second choices. Don't use saran wrap or a plastic bag, which retains heat and moisture too well and can make your bun soggy. 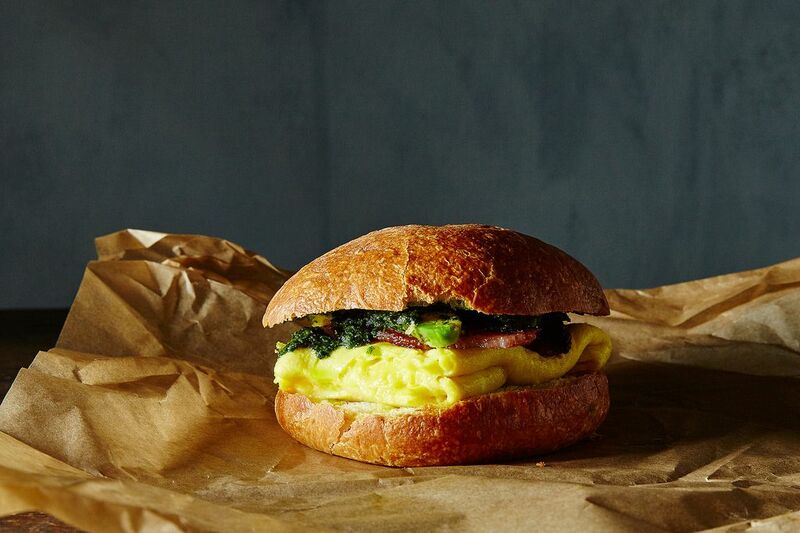 What are your best egg sandwich tips? Let us know in the comments! My father's egg sandwich - perfect and indulgent: toasted homemade bread, Carmelized onion on which an egg is fried soft, melted velveeta (gasp! ), miracle whip and crisp lettuce. It is divine. I've fancified it with homeade aioli, Gouda, Gruyere ... But his is the best. Salud. Jill, his sandwich sounds *amazing*! Can I ask how you suggest I prepare the egg the first time I make it? :) (I want it to taste the best possible the first time!) Thanks much! I like to make a big batch of hard boiled eggs and then slice them up for sandwiches throughout the week for breakfast. It's definitely a different genre than a gooey, melty sandwich made with a poached egg, but also very tasty and a nice quick breakfast. Amazing Maggie! Thanks for that! I do that with burgers but never thought to do it with an egg sandwich! I owe you! Its been my fav breakfast for a long time, but I do it a little simpler: cut and microwave 1 slice of bacon 40 secs in 6" round ramekin. Add 1 egg, a splash of milk to the bacon and wisk lightly. Add cheese, pepper. Microwave for 1 minute. Meanwhile, prep a fresh (homemade sourdough) bun with condiments, lettuce onion, tomato. Slide out the egg/cheese/bacon onto the bun. 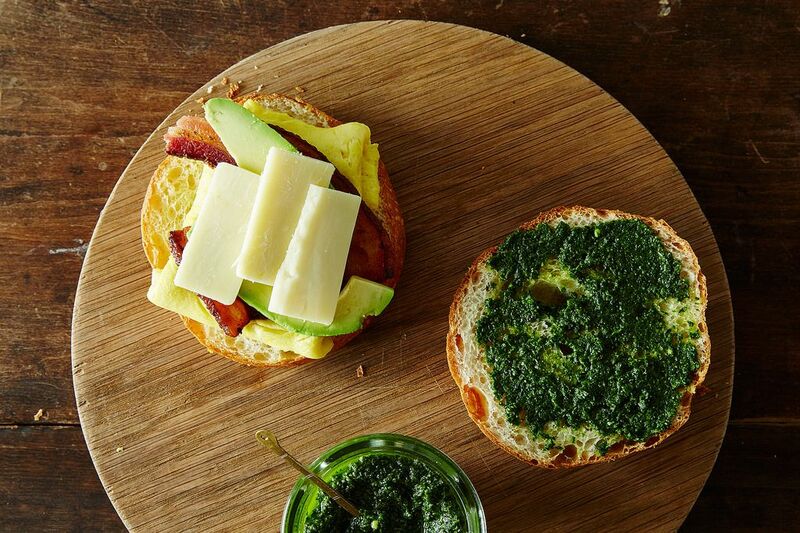 A 2.5 minute delicious breakfast sandwich. I used to drive a big truck. I wished for a great breakfast egg sandwich almost as much as I wanted a nap. I only found one - in southern Oregon. I still think of it sometimes. Re the Julian date, umm, no: "choose the highest number you can find" only works after Day 45 of the year (assuming the 45-day limit holds true). In January & February you want to choose lower numbers. Thanks Andy for pointing out that exception! I've added in a note to point out the difference in the early days of the year. I ate the sandwich shown above -- and made my own yesterday. This sandwich is really testing my dedication to fried egg sandwiches. 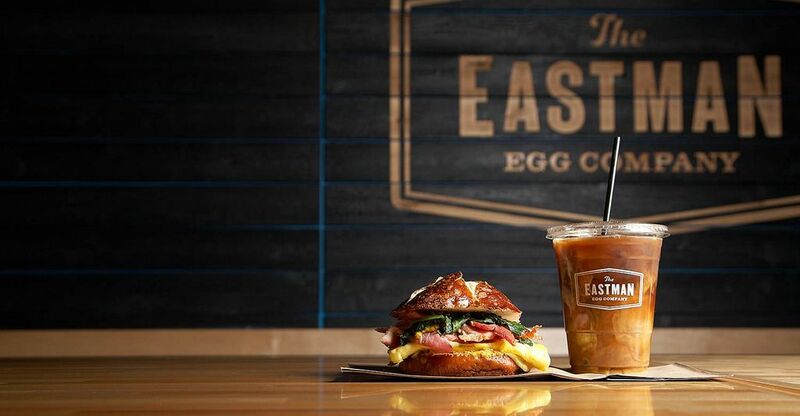 Congrats to Eastman Egg Company! Chicago Represent!